Butterbees and Bumbleflies – Page 86 – One mom's journey through the crazy world that is parenthood. One mom's journey through the crazy world that is parenthood. Hard to believe it, but we are about to be the parents of a crawler. Little Miss “I can roll everywhere” is finding that she can move a little faster if she gets up on her knees… Life is about to get VERY interesting! I’ve been wanting to have a simple weather graph to mark daily when we sing our “What’s the Weather” song (someday I’ll figure out how to attach a voice record! ), so I decided we’d just make one! Super simple. All you need is blue and yellow finger paints, a paper plate, Sharpee marker, cardstock of any color cut into an arrow, and a brad! 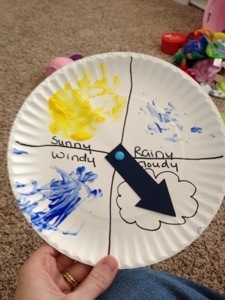 One yellow hand painted circle/oval makes the sun, blue hand streaks for wind, finger dots for rain, then draw/write your labels, and attach your arrow! Wahoo! And talk about taking ownership! 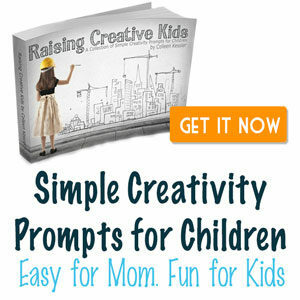 No matter the age of your child, they love looking at their own creations more than something pre-made and store bought!! Such a quick and fun project! Teething – Terrific or Terrible? Well, it’s happening. My sweet little Princess cluster teeths… and it’s that time again. Her upper centrals have both popped through in the last two days and her upper left lateral is very close to arrival in the mouth as well. I love that she has teeth. It makes it so much easier to feed her foods she loves – especially since she is Miss Independent and does NOT want me to feed her anymore. But, there is a down side. It breaks my heart to see my baby hurting. My normally happy-go-lucky almost-9-month-old now busts into tears for no reason, and is just overall whiny these days. Sigh. It’s all part of the process of growing up… and as I have said before, it’s one of the many reasons God in His grace doesn’t make us remember how it feels to be a baby. Affiliate Links – Thank you! Butterbees and Bumbleflies Blog at WordPress.com.